With a wealth of information readily available online, consumers are now better able to compare products, services and prices—even as they shop in physical stores. When consumers interact with retailers publicly through social media, they have greater power to influence other customers or damage a brand. These and other changes in the retail industry are creating important opportunities for retailers. But to capitalize on those opportunities, retailers need ways to collect, manage and analyze a tremendous volume, variety and velocity of data. 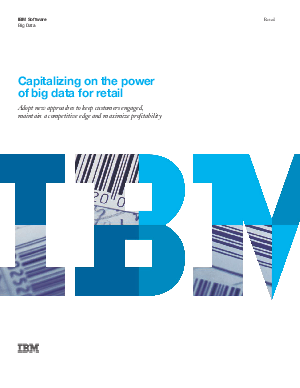 If retailers succeed in addressing the challenges of “big data,” they can use this data to generate valuable insights for personalizing marketing and improving the effectiveness of marketing campaigns, optimizing assortment and merchandising decisions, and removing inefficiencies in distribution and operations.